Sue has been part of the WRFN story since the beginning, watching us grow from a small group of volunteer families into a thriving organization that’s now equipped to support thousands of people affected by special needs. As executive director of the WRFN, Sue oversees all operations and represents our organization on many community collaborative councils, boards and committees. A Wilfrid Laurier University graduate, Sue enjoys spending time with her family, including her husband, Mike, and her two adult sons, Greg and Kevin – both of whom have exceptionalities. She has also been an active advocate for disability-related issues in our community for over 28 years. In that time, she’s volunteered for several organizations, such as KidsAbility, KW Habilitation, the Waterloo Catholic District School Board Special Education Advisory Committee and KW Counselling Services. She currently sits on the Lutherwood Parent/Community Advisory Committee. Carmen has lived in Kitchener-Waterloo since 2010, and has run Coffee Club since October of 2011. She has a Master’s Degree from the University of Illinois in Rehabilitation. She is passionate about helping everyone build community, especially those with disabilities. Her other passions include food and TV. She loves to meet new people and help in every way she can, so do not hesitate to reach out! Cristina has always been drawn to work with populations with exceptionalities, and as an adult she discovered that she has exceptionalities of her own. She has since grown into a community self-advocate by co-founding a peer support group, sitting on committees, volunteering as a mentor, and through public speaking engagements. Cristina is passionate about sharing her lived experience, and she worked with WRFN to create the Ask A Self-Advocate Program in 2017. Through self-exploration, person-centred problem solving, and with a little finesse, she believes everyone can discover what they need to be at their best and successfully advocate for themselves. After completing her two degrees with UW’s Faculty of Science, Cristina and her husband decided to stay in Waterloo. Now she has a young family, and they enjoy spending time in their backyard playscape/garden and cooking together. For over 14 years Erin has worked with children, youth and families of Waterloo Region in a variety of capacities including children’s mental health, developmental services, intensive family support and resource consultation. 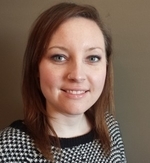 Erin has extensive knowledge of support services and community resources and enjoys facilitating community connections for individuals. Erin holds her diploma in Child and Youth Counseling and is working towards completion of her degree in Psychology and Sociology. Erin is also a parent of two young girls. She is eager to meet and discuss your child and/or family’s unique needs! Krista has been passionate about working with children and youth for many years. In her role with WRFN, she oversees our children’s and young adult programs – an opportunity that allows her to create relationships and environments where everyone can contribute and thrive. Krista has a diploma in Child and Youth Care Counselling, and she’s currently working toward her degree in Social Development Studies. Krista has gained tremendous experience in recent years working in both community and residential settings. Leah has worked within the social service sector for over 17 years in various roles such as Direct Support Professional, Family Supervisor and Program Supervisor for 3 different non-profit organizations. Through these roles, she has had the opportunity to walk alongside many children, adults & families as they find their sense of belonging in the communities where they live. Her previous supervisory roles have had many administrative components to them, which has helped her hone her organizational skills and love for seeing things run smoothly. She hopes to use her skills and unique experiences to impact and become involved in the important work that WRFN does. Leah has worked within the social service sector for over 17 years in various roles such us Direct Support Professional, Family Supervisor and Program Supervisor for 3 different non-profit organizations. Through these roles, she has had the opportunity to walk alongside many children, adults & families as they find their sense of belonging in the communities where they live. Her previous supervisory roles have had many administrative components to them, which has helped her hone her organizational skills and love for seeing things run smoothly. She hopes to use her skills and unique experiences to impact and become involved in the important work that WRFN does.